Opened in 1991, Disney’s Old Key West Resort (OKW) was the first Disney Vacation Club property at Walt Disney World. It is quiet and laid back much like the town in the Florida Keys for which it is named. It has the ambiance of the turn-of-the-century buildings of Key West. We fell in love with it the first time we saw it in 1992. Although Old Key West has grown since we first visited, as construction on all the units was not completed until later, it has still managed to maintain its Key West charm. The resort is built around the Lake Buena Vista Golf Course that goes around and through Disney’s Saratoga Springs Resort and OKW. When we first visited OKW, we went to the Commodore House. This was the sales office and housed the showcase rooms for OKW. The Commodore House had miniature models of what the resort would look like when completed. There was a small movie theater to show a short video on the DVC and how you could use your membership. This is where we met our Vacation Guide who showed us the OKW property and when our trip was completed took us to the Ice Cream Shop where we had sundaes and had a souvenir picture made. The Commodore House has since been demolished and replaced with the last units at OKW. Check-in is at the Hospitality House. Here you will also find a sitting room called Papa’s Den. (Hey, this is Key West after all so Hemmingway must be somewhere.) From there you can wander to the main pool area (there are 3 other pools) complete with a kid’s pool, hot tub, sauna, and a big sandcastle slide. The exercise room - R.E.S.T. Beach Recreation Department - is near the pool as is the Electric Eel Gameroom. At Hank's Rent 'N Return, you can rent bikes, surreys, and watercraft. The Community Hall is also where activities are held daily. OK, now for the technical stuff. There are 50 buildings housing 761 villas. OKW has the largest rooms of all the DVC resorts. These accommodations are Deluxe Studio, One, Two and Three Bedroom villas. The Studio is 390 sq ft with 2 queen beds and a small kitchenette with microwave, toaster, coffeemaker, under-counter refrigerator and a wet bar sink and sleeps 4. The One Bedroom Villa is 942 sq ft with a king bed, bath with a large Jacuzzi tub, full kitchen, laundry room, and a queen sleeper sofa in the living room and sleeps 4. The Two Bedroom Villa is 1395 sq ft and sleeps 8. The Two Bedroom Villas are either a lock-off comprised of a One Bedroom Villa plus a Studio or a dedicated Two Bedroom Villa. The two-story, three bedroom, four bath Grand Villa is 2375 sq ft and sleeps 12. The master bedroom has a king bed and bath with Jacuzzi tub, the second bedroom has 2 queen beds and private bath, the third bedroom has 2 full beds and private bath, and the living room has a queen sleeper sofa with the fourth bath off the hall. It has a large full kitchen and a dining room with a table for eight. Whew… now that we’re through with that… If you want to cook, all but the Studios have a full kitchen (but who wants to cook on vacation?) and the Conch Flats General Store at the Hospitality House has some basic groceries. You can order in advance and have many more grocery items delivered to your villa if you can’t or don’t want to shop at a local grocer. Olivia’s is the resort’s table service restaurant or there is Good’s Food to Go for fast food and the Gurgling Suitcase for your adult beverages. Seasonally, there is also a snack bar and arcade at the Turtle Pond pool. Olivia’s originally had two mannequins gracing the dining room. Miss Vicki, in period dress, stood near the check in counter and sitting in the corner booth was Captain Wahoo in his blue & white striped sailor’s shirt and his captain’s hat. The walls were covered with vacation pictures framed by DVC members. Several years ago, both Miss Vicki and Captain Wahoo were removed. Almost all the pictures were sent to hang on the wall in the Community Hall. The best dessert at Olivia’s – Key Lime White Chocolate Mousse - also went away as the menu has changed over the years, but Olivia’s remains one of my favorite places to eat at WDW. We have now stayed in all of the different accommodations. If it is just my wife and I, we normally stay in a one bedroom. When we have our family with us, we reserve a two bedroom villa. We had never stayed in the three bedroom Grand Villa until this past April when we celebrated my granddaughter’s first birthday. It is a very spacious open floor plan that was great for celebrating a birthday. When we first walked in I turned and asked my wife “can we keep it?” We’ve kept the DVC for 17 years now and intend on having it quite a while longer. 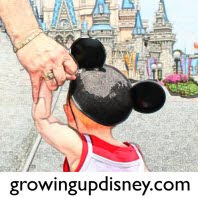 If you’d like to know more, drop me a line at DisneyDad28@gmail.com and I’ll answer your questions or share my Vacation Advisor with you. Check out http://disneyvacationclub.disney.go.com/ for more info about OKW.